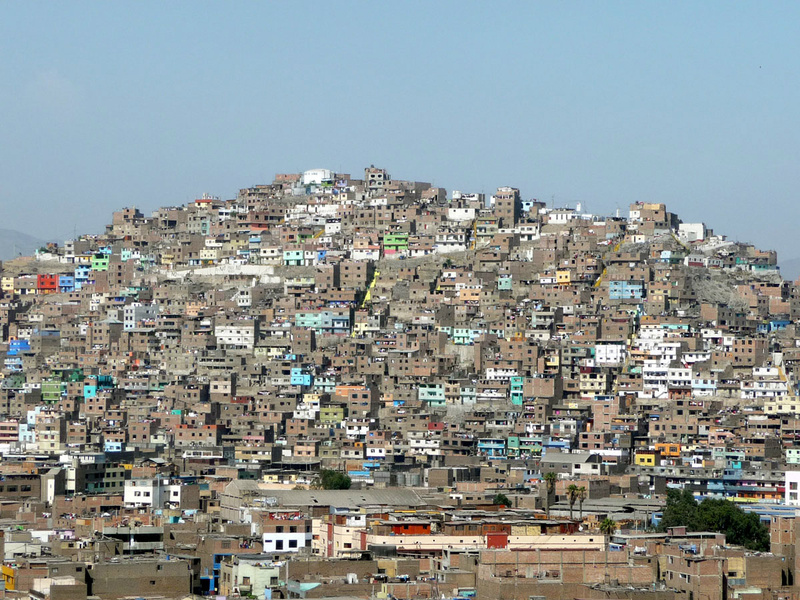 Lima, Spontaneous city landscape. The city expands rapidly. People built their houses with no plan, permission or loan. They migrate from the mountains to the capital in search of work and a good life for their childeren. This massive growth is not planned, people just DO it. It becomes a landscape of houses and activity. It just never sleeps and gets bigger every day. On a high building you can see the sea of houses covering the land and the mountains. 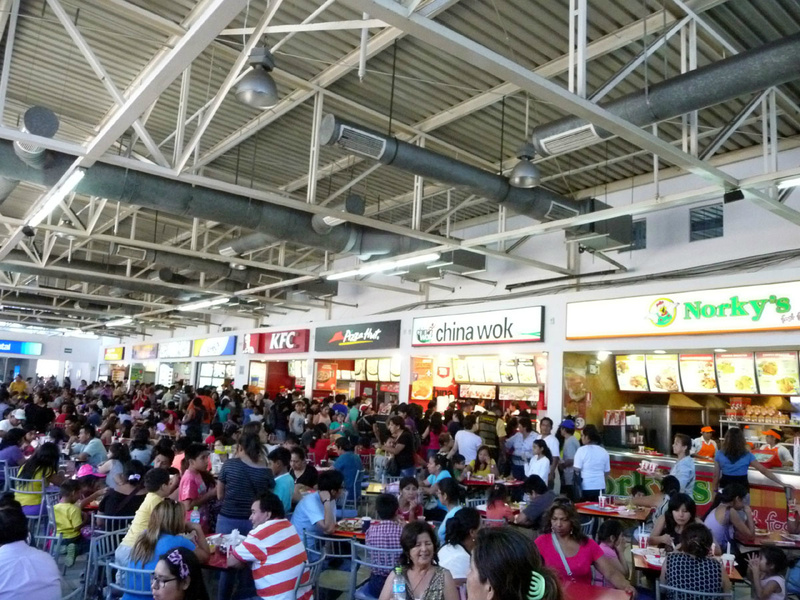 An ugly building called Centro commercial, has typical services like banks, cashmachines, tourist information and in the heart the thing that everybody is here for... Fastfood. In the street around it you can find all ingredients from all over the country. Coconut, exotic fruits and ofcourse the traditionally home-made meals with super fresh and good nutritions, that are very tasty and affordabel But... What seems to be most desireable to Limaneans is the crapfood from KFC, Pizzahut and more... To us this is so hard to understand. It feels like a habit to deny the own core. Very important is conveniece and the appearence of another reality. 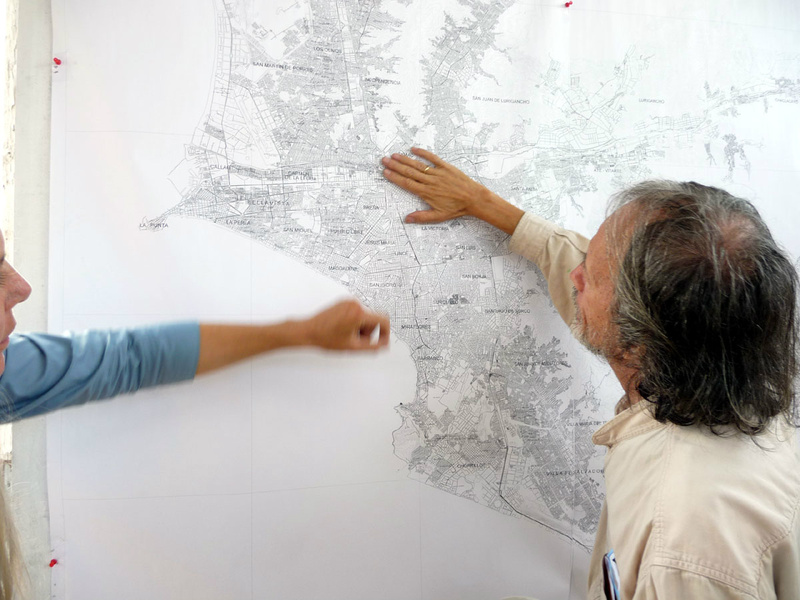 We observe and try to understand a cultural identity of people living in Peru. Somehow everything foreign has the aura of Wealth, capital and succes. 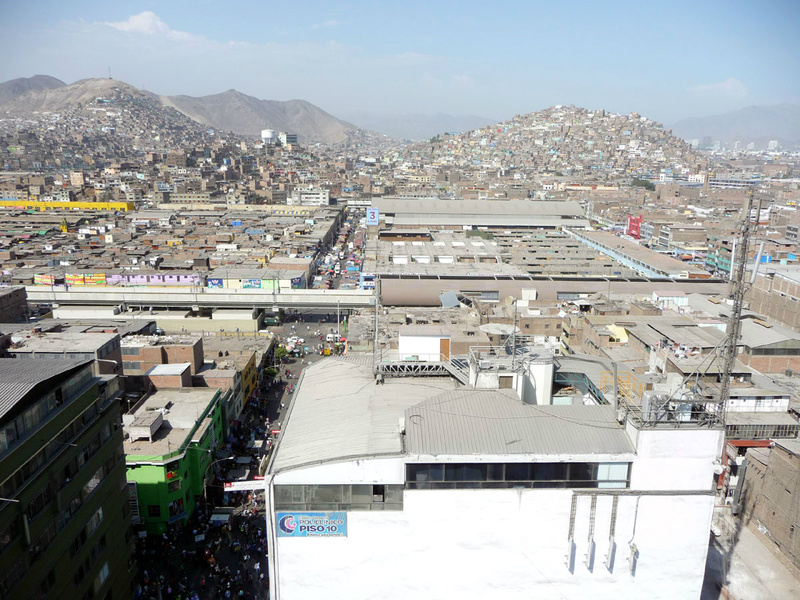 Somehow it is that image of succesfull living that makes people come here, certainly NOT the food. This is an interesting clash of scale, culture and function. 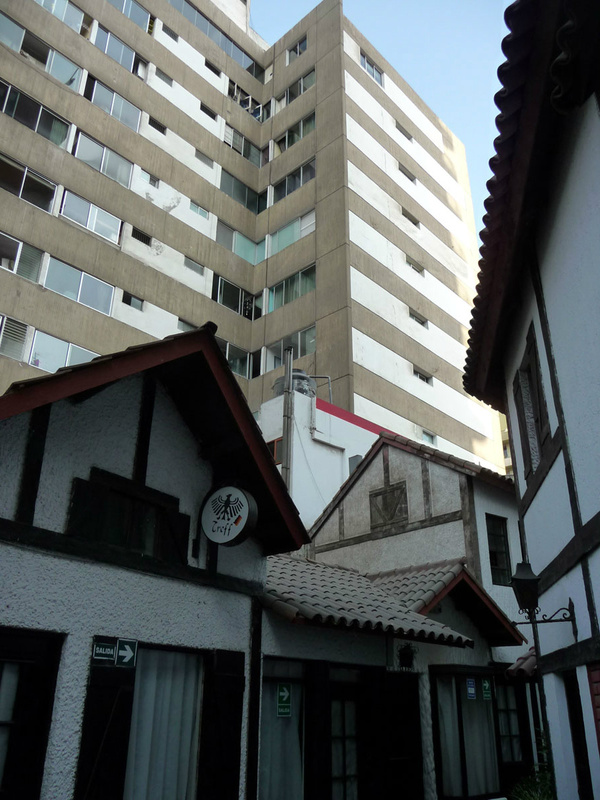 It is a site in Miraflores carefully designed as if you visit a village in Bavaria. It has a pittoresque streetplan and tiny public squares like a typical German village, with wood frame buildings and white stucco. It contains a Kneipe, a biergarten and little craft stores. All day it sits is in the shadow of neigbouring office towers. It has been there for many years and all businesses that were starting here, somehow failed. It feels very much out of place but the beer is good! Pirates Paradise. 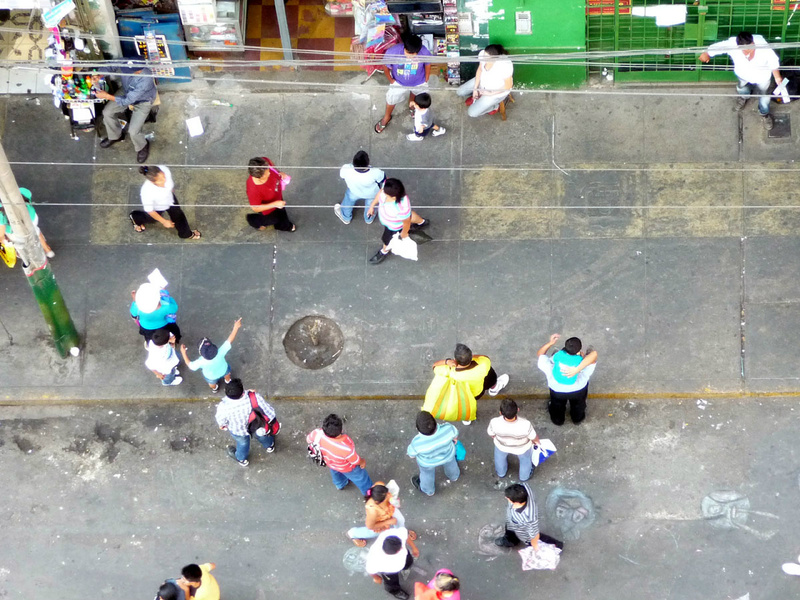 Peru is the safe harbour for any violation that has to do with intellectual property. Here it is really something else. 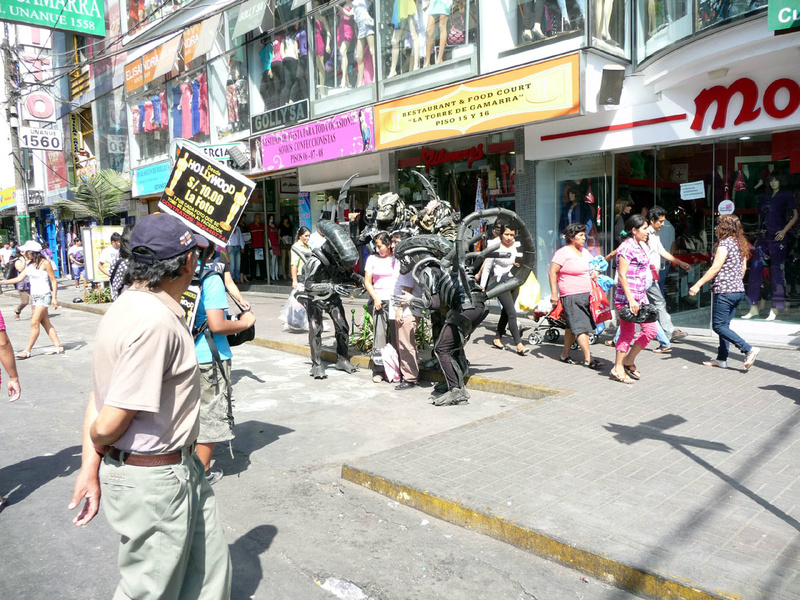 Everytime a motionpicture is released in he US, already you can buy it in the streets of Lima. All DvD and Cd is available for like 3 soles or less (about 1 euro). Everthing which can be duplicated is available, also on demand and home delivered. Arthouse movies or cheap hollywood crap, it's 3 soles. This image is a tiny shop with a flatscreen hanging on the wall, behind the guy in purple shirt. The proprietor makes a teaser of the best scenes (a lot of screaming and noise) and people stop, watch and buy the copy. Very democratic for the people but not to the artist or industry. 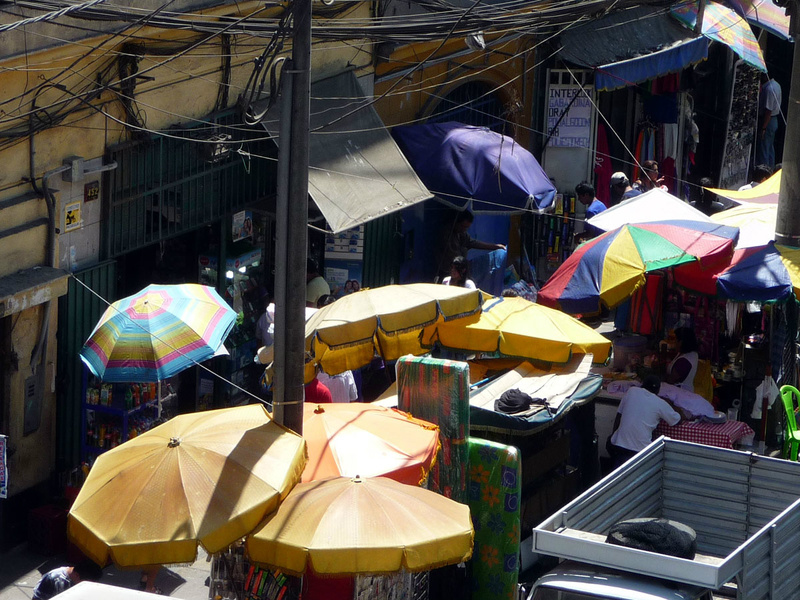 Next to the railway station there is a long line of little businesses, we call the umbrella market. It is very energetic and every day different. a good example of an active sidewalk! Selling underwear and slippers at Umbrella market. Part of the public life is that mothers have a family life during their job. They call, eat, drink, teachand educate while they try to make their living with selling on the market. It all blends in with the energy and activities on this sidewalk. 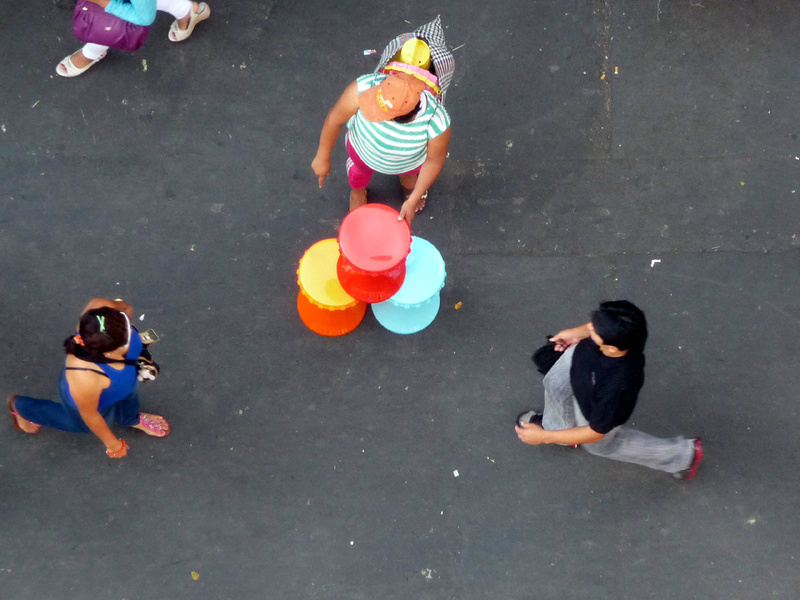 street performance. Many people gather when artists are performing in the street. The guy in the yellow shirt is doing streetdance. The public domain used to exercise your skills and fullfill dreams. 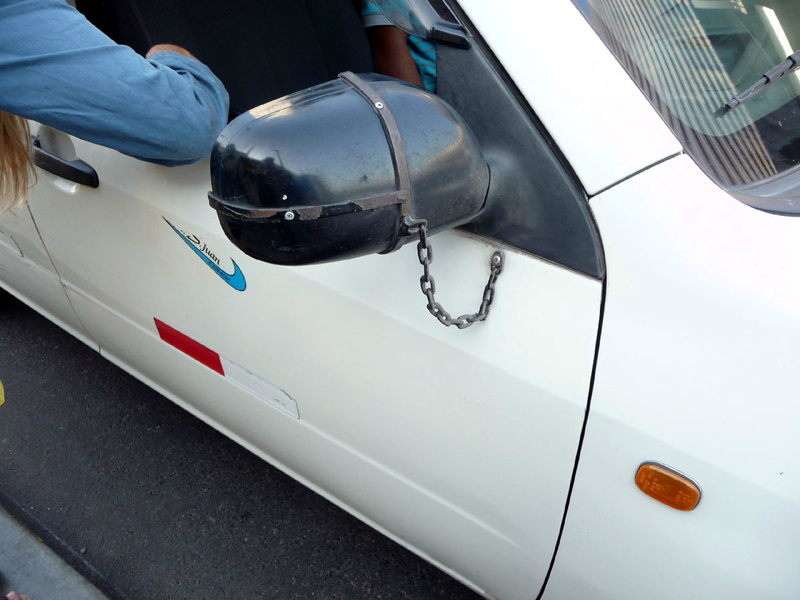 Manytimes the performance is stopped by the police, though. The best food we found in the street. Today we have experienced one of the best meals in Lima. Whenever a restaurant is really crowded we join in. When there is a lot of customers the food must be good. This is a corner, close to the garment district and there are many things happening on the sidewalk, like this spontaneous restaurant. Always crowded and each day different 'Suggestions of the chef'. 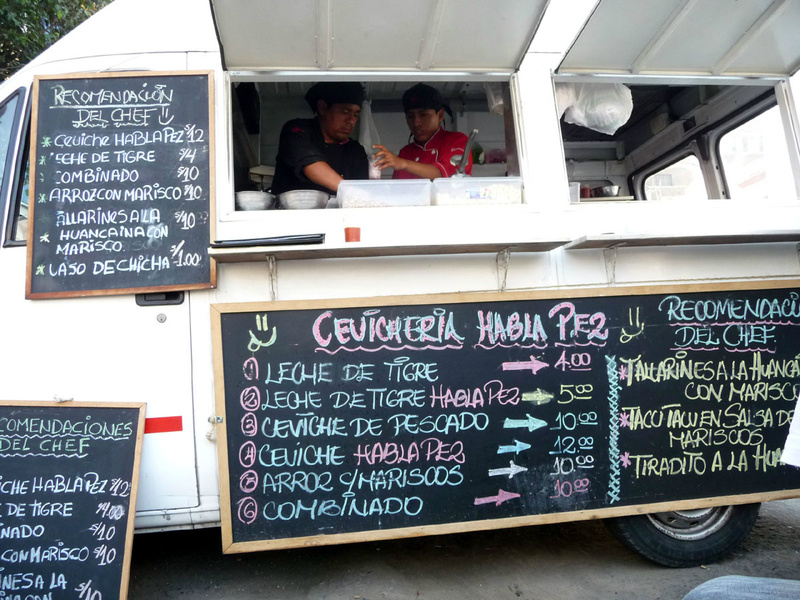 They have the best dishes with seafood, noodles, and classics like the Cebiche. Really good and affordable. Delicious food cooked in this van by these two dedicated chef's. Menu on display changes everyday. Today's special is 'Leche de Tigre' (milk of a tigre). The best was the Mariscos with special noodles. One meal costs about 4 euro's. Your picture taken in the company of aliens. Cable man. Talking to this man he assured us: 'I'd rather not touch it if it works... sometimes when you solve something another problem arises.... 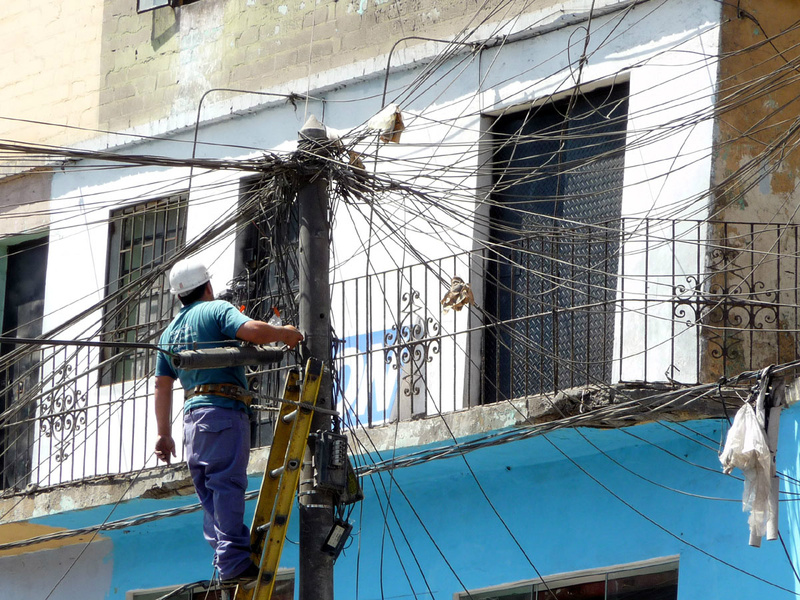 Soon we will make a whole reportage on the cabling in Lima, it is a miracle how it all functions,... electricity for nine million people like this. 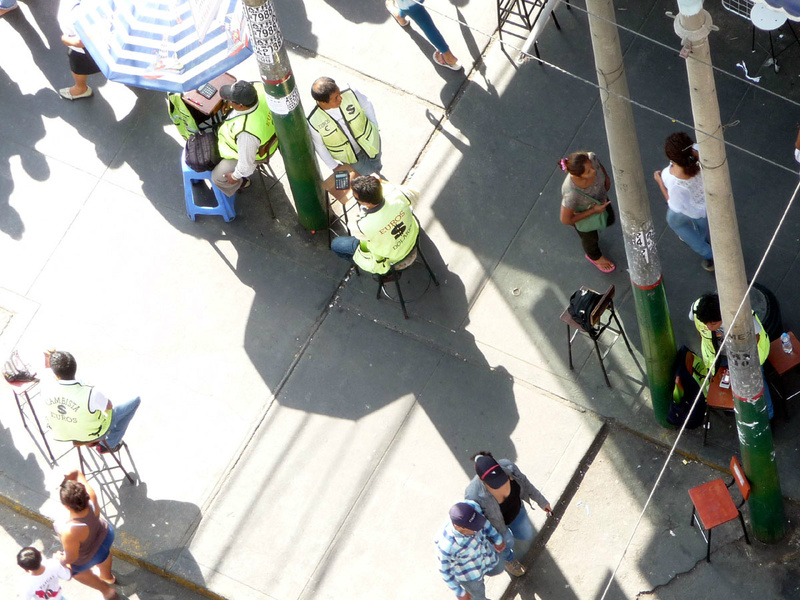 Lima is full of ambulantes, 'illegal' street vendors. 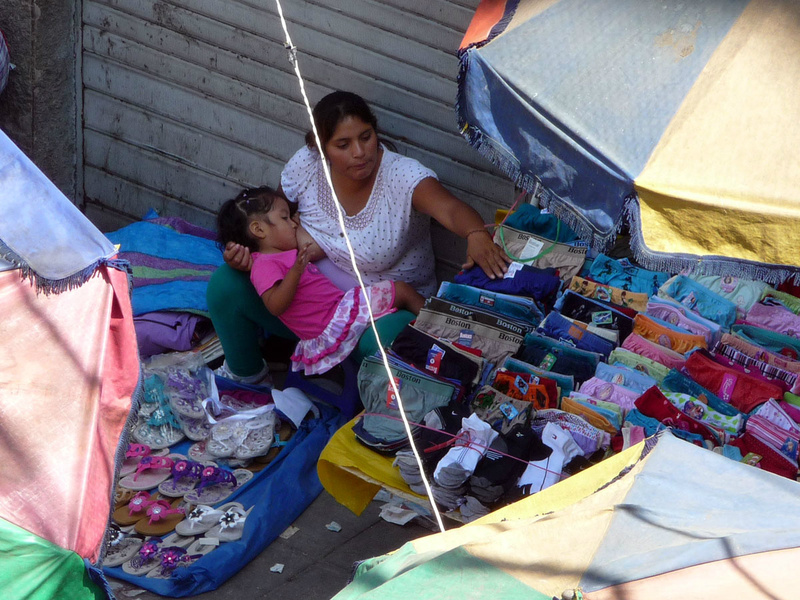 It is estimated that at least half of the total economy is informal. 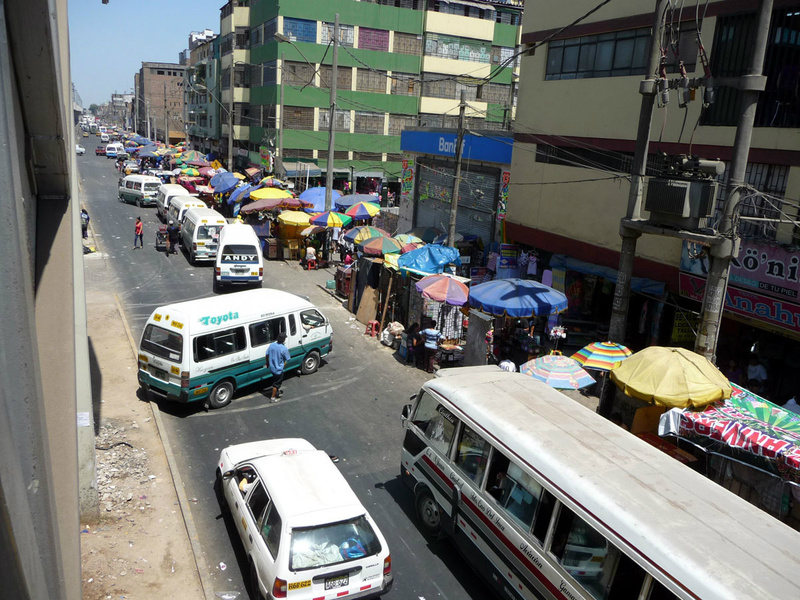 The selling in the streets, taxis, parking, combi-transport, exchange of money... many things are without boleta's (factura, invoices). So many people have a business on the side, like this person selling coloured seats. After selling three, he probably goes to the next job... 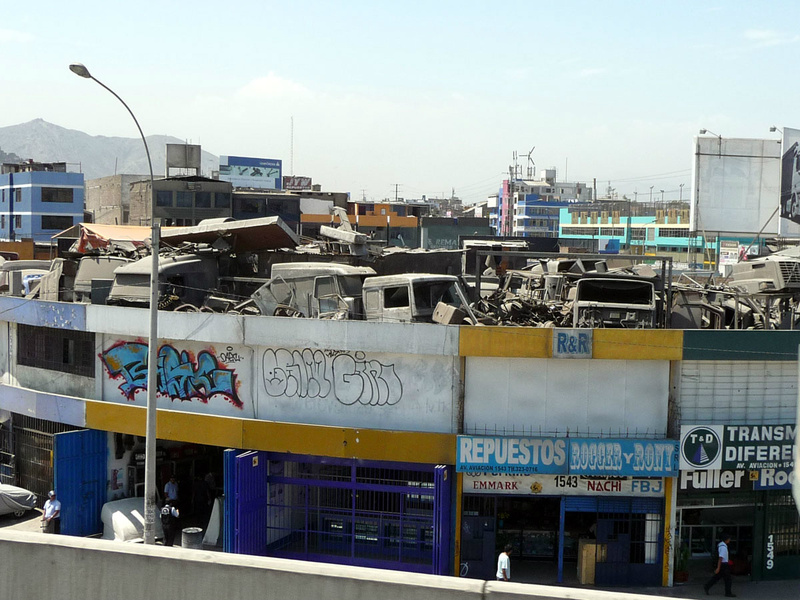 In Lima people say they have a thousand jobs. Dollar-Euro. 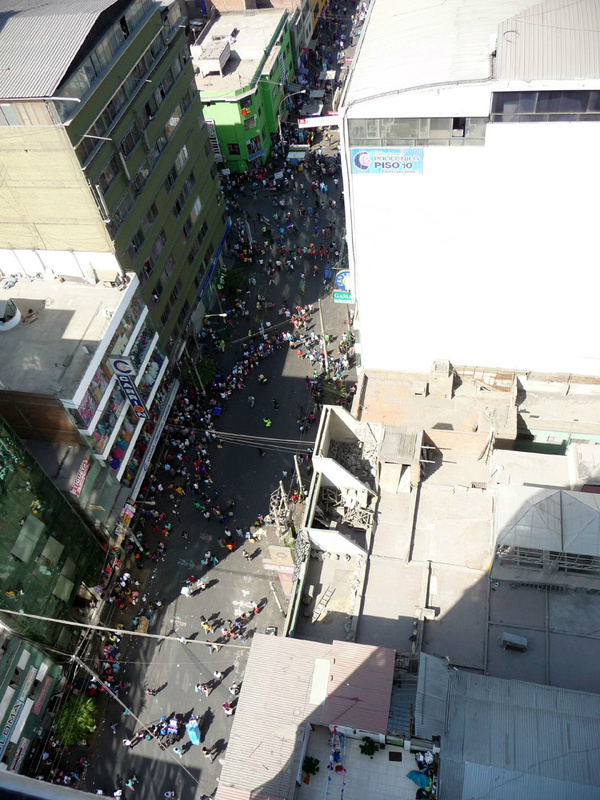 There is an active streetlife in Lima with different actors on the sidewalk. Many things that we do indoors, here takes place outside. Like money-exchange... also an informal enterprise (shadow banking) and many people are active in the exchange business. Mostly man are sitting, armed with a calculator waiting for customers. Often you'll see them out in the open with a big stack of bills counting their profit. 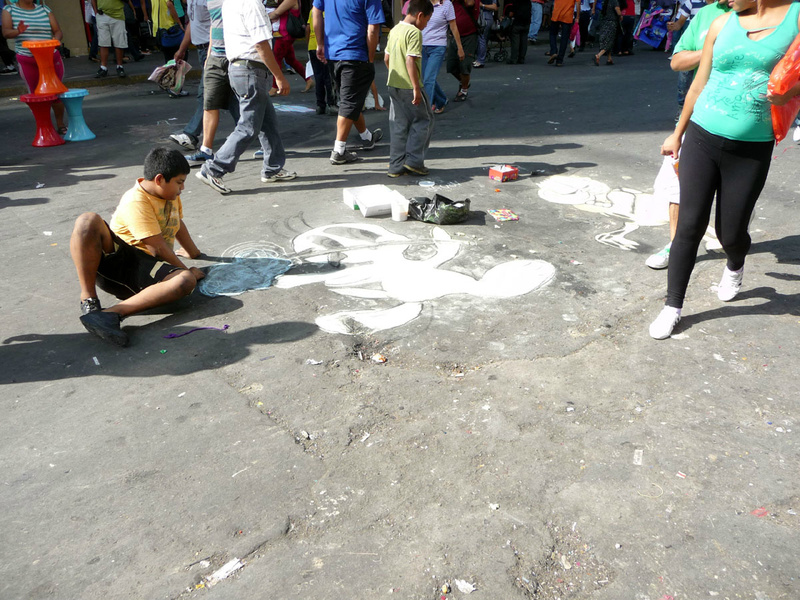 Two boys form the barrio come to Gamarra district to draw with chalk on the street. They have little cartoons from Disney, as examples. 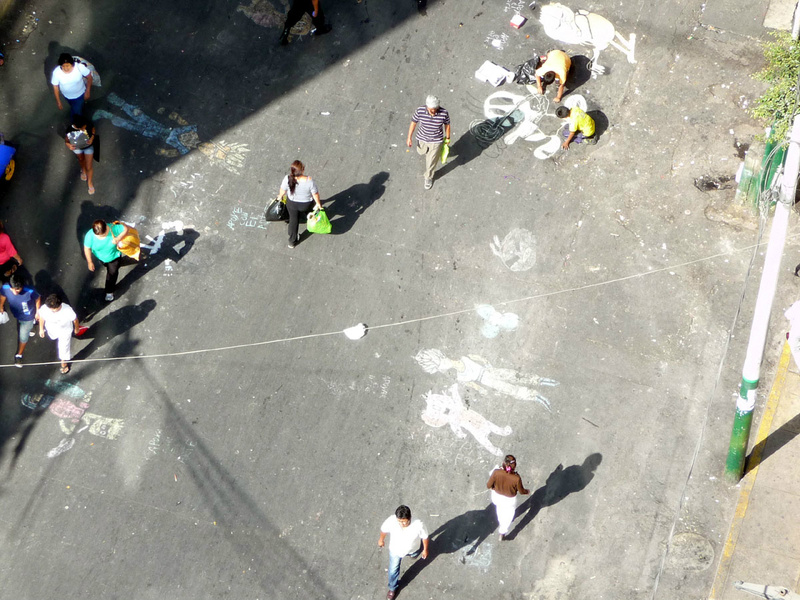 chalkdrawing in the streets of Gamarra. A meeting with close neighbor and historian/artist Henry Ledgard. We have meetings with people about our Osma- maquette. This man lives close by and teaches us in history, geography and filosophy. 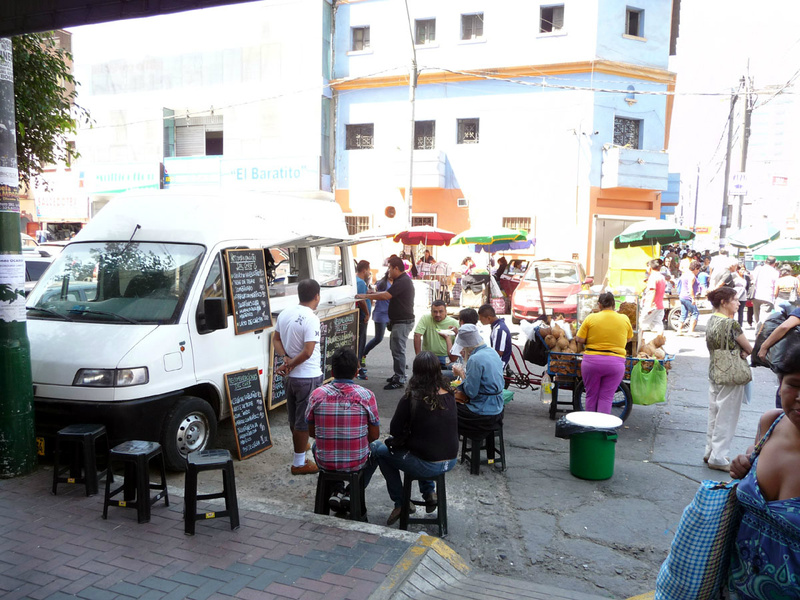 We have had some conversations about Lima and more specific Barranco, lasting for many hours. Very interesting stories and background information. We learn so much by doing ... Here we take in consideration the whole of the metropolitan landscape...., ocean, mountains and also the earth its self ... because the land has a history of eartquakes.